Fantastic Week in the Sunshine State Exhibiting at NPE2018! Our booth at NPE2018 this week in Orlando has been extremely busy! We’ve had a fantastic and successful week at the Orange County Convention Center (OCCC) in Orlando, FL (U.S.) exhibiting at NPE2018. Held every three years, the week long Plastics Showcase brings together over 60,000 attendees to learn more about the latest breakthrough innovations and game-changing technologies in the plastics industry. Constant booth activity has offered us the wonderful opportunity to discuss with attendees our comprehensive portfolio of Halogen-Free Fire Retardant Additives, Ground Calcium Carbonate Extenders and Martoxid® TM Thermally Conductive Fillers for a variety of plastics-related applications. We always look forward to great events like these when we’re able to get out to meet and greet current customers while also introducing and discussing our comprehensive portfolio of specialty engineered materials with attendees who’re interested in learning more about us and our extensive product offerings. 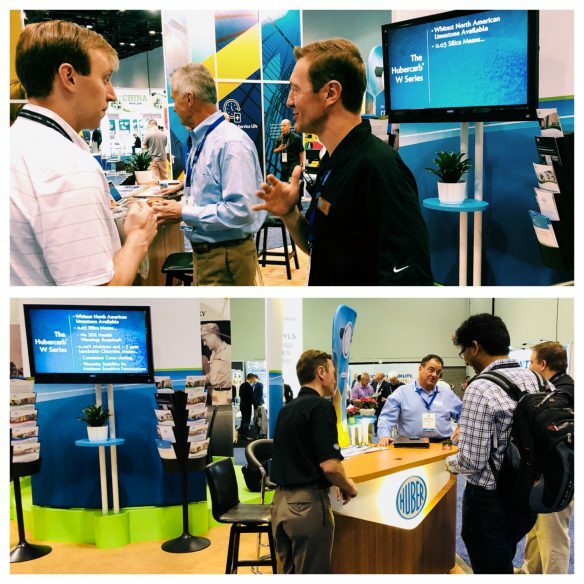 We’ve enjoyed great weather in Orlando all week and look forward to following up with everyone who took time out of their busy schedules to visit with us in the South Hall of the OCCC in booth #S11201.